In 1985, the Los Angeles Times conducted one of the most extensive surveys of journalists in history. Using the same questionnaire they had used to poll the public, the Times polled 2,700 journalists at 621 newspapers across the country. 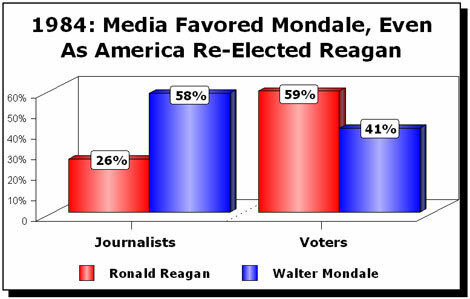 By a two-to-one margin, reporters had a negative view of then-President Ronald Reagan and voted by the same margin for Walter Mondale in 1984. The survey also asked 16 questions involving foreign affairs, social and economic issues. On 15 of 16 questions, the journalists gave answers to the left of those given by the public. Self-identified liberals outnumbered conservatives in the newsroom by more than three-to-one, 55 to 17 percent. This compares to only one-fourth of the public (23 percent) that identified themselves as liberal. 'Sometimes the readers and journalists take diametrically opposed positions — as on the question: 'Are you in favor of the way Ronald Reagan is handling his job as President?' Journalists say 'No' by a 2-1 margin; readers say 'Yes' by about the same margin,' Times media reporter David Shaw wrote. 84 percent of reporters and editors supported the so-called 'nuclear freeze' to ban all future nuclear missile deployment; 80 percent were against increased defense spending; and 76 percent opposed aid to the Nicaraguan contras. 82 percent of reporters and editors favored allowing women to have abortions; 81 percent backed affirmative action; and 78 percent wanted stricter gun control. Two-thirds (67 percent) of journalists opposed prayer in public schools; three-fourths of the general public (74 percent) supported prayer in public schools.